Yeah quality varies. Some is pretty much unreadable. “It isn't right to name someone specific but I can say that this is the best group in which I've played. Here, we are a squad, elsewhere, some players feel bigger than the others, instead here, everyone is on the same level, they are humble and want to win. If Dybala or Mandzukic don't score, they are still happy and they smile. It's really nice and I can see the difference. In Madrid they are humble but here I feel they are more so. It is very different from Madrid; this is a family." I'll try to find back the FourFourTwo article. One of the problems is also that there are vastly conflicting newspaper reports, more so than other countries. But at least Tropeiro backs up (approximately) what I said above on the probable numbers. Ultimately though, one has to check it with the underlying numbers. We know Puskas was there since 1959 when Real Madrid went 121 games unbeaten at home (between 1957 to 1965), while Di Stefano missed a number through injuries in the middle of that streak. Next to his international games (for club and part of a dominant country team), it rings a bell when he ends up higher than AdS by metrics of that type. Cruijff has the all-time highest win percentage for the Eredivisie and also the highest win percentage in Primera Division for his era and the era after that (until ironically, the advent of Quintre del Buitre and then his own return as manager). Real and Atletico Madrid divided the titles among them, but had both also a few seasons where they finished 6th, 8th, 10th etcetera, 'destroying' the win percentages of the involved (star) players. Cruijff finished 2nd three times, 1st once and 3rd once (Barca in the Simonsen/Schuster/Maradona era 1979-1984 finished 4th to 6th). So intuitively it adds up (when four tournament MVPs were playing there; Netzer, Kempes, Caszely, Cruijff himself). Then add in how poorly those teams did when he didn't play (both domestically and in Europe), and his multiple deep runs in knockout competitions (for 'player Elo' type of systems that helps, next to contemporary players), and it all doesn't go against logic I'd say, in my humble view. Thus, in a more sophisticated model that corrects for home venue, strength of opponent and all the rest it is not really a surprise that he comes out reasonably well. It is difficult to say how the value would be affected when also the Ajax years are included. The longest consecutive absence was during the 1970-71 season where he missed the first 10 games and Ajax was sixth in the table at his return (5W 3D 2L) - except for a brief 15 minutes cameo where his injury returned and had to be subbed out again. Where the registered draw forced a replay match, and all losses meant elimination (except for the 1968 final, which was just a lost game). The cup match they lost with him playing took place in the 1968-69 season against Feijenoord (1-2 loss). This also includes the Intertoto games (1W vs 1W 2D) next to the other European games (1W 3L without him playing). Another thing is that it is obviously not sensitive to substitutions, such as a 22th minute substitition against Trnava where he got kicked out of the game (Trnava scored the winning goal briefly after). Good to know. Makes assesment of Brazilian players outside of World Cups a bit of a guesswork. That's the stat I had in mind. Thanks for posting the writeup. “While presenting this year's Ballon d'Or to Cristiano Ronaldo, Pele uttered his name as 'Cristiano Leonardo'. This just shows where he belongs." He took the wrong pill. Instead of taking the pill for before bedtime, he took his morning pill. He got confused. I suggest that next time he takes the right medication and that he changes his doctor." Obviously the margin of error for penalties is even higher as counting the goals. But as said, Tropeiro his numbers back up what I said above: likely around 100 penalties or perhaps slightly higher (111 penalties); a share that is not as high as Zico; etc. .... there is consequentially a small possibility that he scored his 1000th goal before or after the 'official' occasion. I agree with you and I am sure anyone else who also watched enough games from Pelé will agree with me. The huge number of goals makes people to think that he was a goalscorer kind of player, but he was more a playmaker. It was insane how he cleared any play, how he made everything looks easy. Pele was an impressive goalscorer, but his dribbling and playmaking were something else. This blog has lineups/goalscores about Brazilian competitions. I think it's taken from Folha de S. Paulo, another source that can be used is Jornal dos Sports. So from what I've seen Pepe was Santos penalty taker up until 62 or 63. 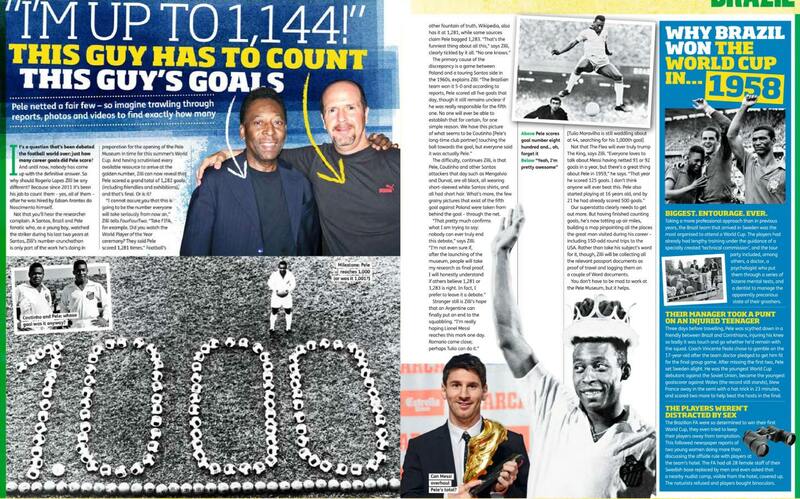 Pelé could have easily added 10 more goals to his tally each year if given penalty duty. Just think that's shocking given how Pelé has the reputation today that he did everything possible to statpad his goals and it was his statistical goalscoring peak. Very good find. Good job ! Basically proves my theory. Many of those you can identify as being against good teams of the era. Regardless, the skills and versatility shown (as an attacker) with Pele are undeniable. I guess all you're looking for is consistency. Because there is plenty of proof he performed against big teams. literally his game compromised of dribbling a drunk/beer bellied/semi pro defender and whipping in a cross from the byline. Iirc Bella Kona was a member of this forum. I remember when he and some Brazilian fanboy known as James used to post lot of Pele compilation football videos here. Glad I'm not the only one who made that observation. His dribbling in the '62 WC wasn't even effective. Scored most goals with long range shots. Too little is available from Garrincha on video. His dribbling doesn’t seem like what you would think of a great dribbler today or from the 70s on. He seemed to have an extremely fast first few steps and beat defenders from the wing with that asset . 2 goals in 58 final came from that move . His 62 goals didn’t come from dribbling indeed , but I think it’s credit to him he changed his game once Pele was hurt and ended up being very influential with an aspect of the game he wasn’t known for . How do you know that’s James ? He was rally annoying . I don't question his achievements or that he was overall a fantastic player for his time. However Garrincha is the only older legends I've watched where I really get the impression that his skillset wouldn't work well in a different era. Too little is available from Garrincha on video. You're not wrong, but I guess his overall playstyle wouldn't vary much? Just not very fond of his decision making and ball hogging. I don't question his achievements or that he was overall a fantastic player for his time. However Garrincha is the only older legends I've watched where I really get the impression that his skillset wouldn't work in a different era. You're not wrong, but I guess his overall playstyle would be similar? Just not very fond of his decision making and ball hogging. I agree . He wouldn’t fit today’s game. He’d have to change a lot. Would he even make it to the top level in today's game? Given how demanding managers are nowadays, I wonder if a player like Garrincha (or even Romario) would even be accepted by the Klopp or Guardiola or Simeone of this world. Doesn't help that Messi and Ronaldo has raised the bar for professionalism required of the team's star player. Being the best doesn't excuse lack of professionalism anymore. In fact, you are expected to set an example for the rest of the team. I can only see him accepted into teams like PSG or playing for a manager like Wenger.